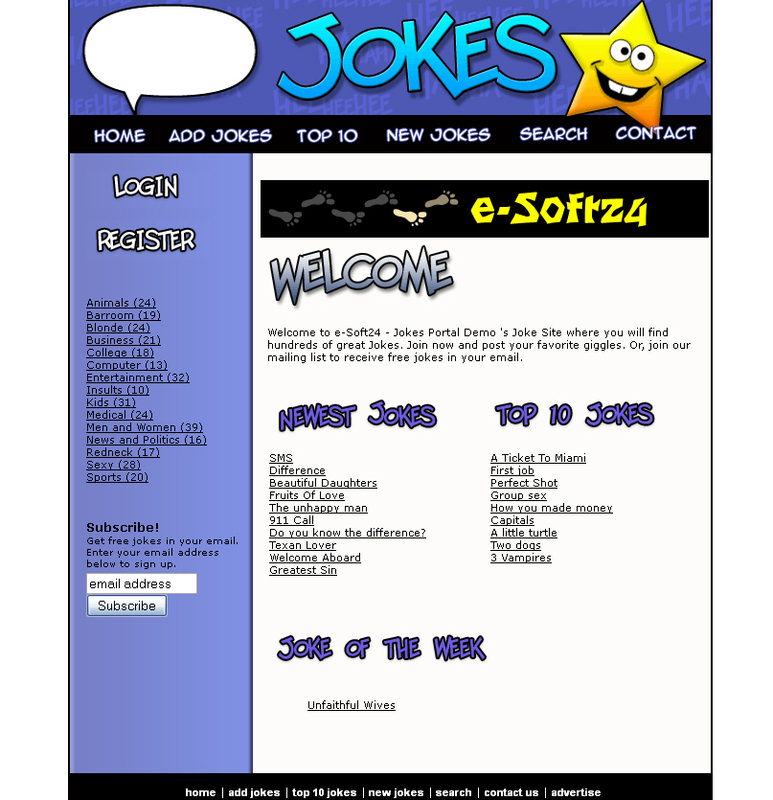 e-Soft24 Jokes Portal Script allows you to run your own jokes portal web site like jokesgalore.com or jokes.com. You can instantly start a high traffic site, earn money from adsense, affiliate programs and pay per impression. Let your visitors subscribe to your jokes newsletter and they will always come back to your site. This PHP script is very easy to install and comes with detailed installtion instructions. You can also use it for an adult jokes portal. - Create your own joke categories, as much as you like. - Display top 10 rated jokes. - List jokes by category. - Social bookmark modul, that allows your vistors to easily add your joke url's to popular bookmark sites like StumbleUpon.com, reddit.com etc. - Registered users will automatically subscribe to your newsletter system. - Not registered users can easily subscribe to your newsletter system. - Contact form to prevent spam. - Email this joke to a friend feature.